…let’s talk about Susan Minnich..and me! 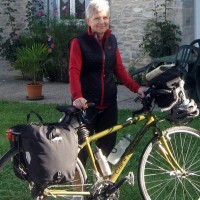 Suze, as the blogosphere knows her, is a fellow cyclist who specializes in solo south France voyages that always result in some great routes for my website. In the frigid New England winter Susan rides on her indoor trainer, thinking up blog article ideas for ‘news-light’ hiver. How does this get back to me, you ask? Well, one of those ideas was to do interviews with fellow cyclists and I’ve been honored by being asked to babble on for two full web pages on her blog. I can babble with the best of them, so get ready for some involved reading! It’s easy when you have no kids or an animal farm. It’s not very impressive in the cycling scheme of things, I’m afraid. I’m a rank amateur in the touring business compared to some friends I have. That was quite an informative couple of posts! I may reread parts. Thanks to Suze! Thanks, it seems that interviews are à la mode at the moment. I have to sit down and finish yours with your fellow two-wheeled commuter as well. I admit to being surprised to see the interview with you. I thought of doing one (for lack of anything else in the winter) a few weeks ago and wondered if anyone would beat me to the idea [Vanity, vanity, all is vanity!]. I am relieved to see that I am not all that weird in my thinking! I would love to come to France and ride some day. Thanks for posting this … it was way fun to write the interview … I hope my little site sends half as many readers your way as you have mine. And just maybe all us cycle bloggers put together will encourage some new riders to put foot to pedal and find their own way of enjoying riding a bike. Thanks for asking the questions! It’s not every day a someone wants to interview me (no really, it’s true..). And you’re right, the world needs more pedal power. Wow, I’m missing the boat on all these interviews (nicely done, btw, Gerry). Does anybody know Levi Leipheimer’s number? Nope, sorry. But I’ve got Philippe Gilbert’s. Oh. Yeah. Just kidding. Someone told me I wasn’t supposed to do that in print.